Turkey helping Iraqi Kurdish peshmerga fighters to cross its borders to join Syrian Kurdish forces battling the Islamic State of Iraq and Levant group for the Syrian town of Kobane. “We are assisting peshmerga forces to cross into Kobane,” Turkish Foreign Minister Mevlut Cavusoglu told reporters in Ankara on Monday, adding that talks on the issue were ongoing but without giving further details. Al Jazeera’s Bernard Smith, reporting from the Turkey-Syria border, said the announcement represented a major shift as Ankara has so far refused to allow Kurdish fighters from Turkey itself to cross its border to join the fight. “They [the Kurdish fighters] have been waiting on this side of the border since ISIL started to encircle Kobane,” our correspondent said. The shift came after a phone call between US President Barack Obama and his Turkish counterpart, Tayyip Erdogan. Turkish presidential sources told Al Jazeera that during the call Obama described the situation in Kobane as “desperate”. The US on Sunday began airdropping weapons and supplies to Kurdish fighters defending the Syrian city against ISIL, despite Turkey’s continued objections. 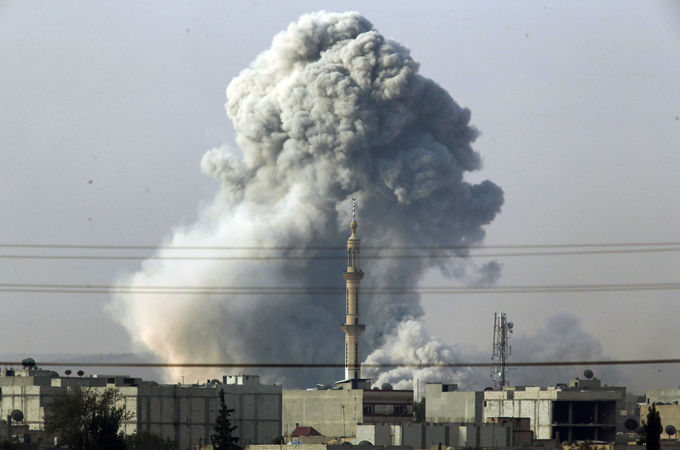 The airdrops followed weeks of US and coalition air strikes in and near Kobane, which is near the Turkish border. Turkey objected to the move because it considers the main Syrian Kurdish group, PYD, an extension of the Kurdistan Workers’ Party (PKK). The Turkish security forces have waged a 30-year conflict with the Kurdish fighters of the PKK, whose battle for self rule has left 40,000 dead. However Turkey has recently forged strong relations with the Kurdish authorities in the Kurdistan region of Iraq who control the peshmerga forces. Despite the agreement, it seems Turkey will continue to block any PKK fighters from entering Syria, AFP news agency reported.